SentrySafe offers a secure way to keep your important documents, sentimental items, and anything else that needs to be safe and secure through all sorts of disasters and situations. It's always important to have at least one safe and secure location to keep important things in your household and that's why SentrySafe is going the extra length to prove how durable their safes are by burning one live for everyone to watch. Inside will be lots of cash that will stay safe because that's how high of quality fire-proof SentrySafes are!!! Tune in tomorrow (August 1st) to watch live! I received a Combination Fire Safe from SentrySafe! It's got a pry-resistant hinge bar, and has superior fire and water protection. 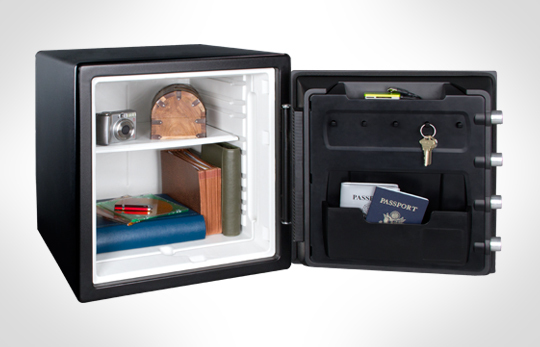 Inside it features a key rack, door tray, and multi-position shelf. It's ETL verified for 1 hour fire protection of CDs and DVDs up to 1700 degrees! It's also water-resistant for up to 8" of water for up to 24 hours! And of course it comes with a manufacturer's limited warranty and lifetime after-fire replacement guaranteed! I love the smooth mechanical lock. Never any problems getting into it. I love that it can be bolted to the floor if need be! I keep my important documents, files, belongings, and keepsakes in this thing and I know I can rest easy if something ever happens because everything will be in a safe place until I can get to it! One lucky winner will receive a Combination Fire Safe from SentrySafe as well! I like their Keep/Safe Combination Safe-KS0130. My husband and I have been talking about getting a safe now that we are starting to accumulate a lot of important documents. This would be wonderful to have! Thanks for hosting this giveaway, Ellen! :) I'd probably go with the Electronic FIRE-SAFE SFW123GTF. I like the Media Fire Cabinet - 1856CTS its big and looks nice! There are several I like a lot, including the security safe 888 and their various gun safes as the latter would be nice for my hubby's firearms and the first for safekeeping of some of my important things....I also really like this one that is being given away as it's a perfect smaller sized safe that would be great to put important stuff in, like our birth certificates, passports, vehicle titles, AKC paperwork for the dogs, and various other important items like negatives for my favorite film photos and memory cards for newer digital photos etc. I like that it has the handy key rack on the door....that's something I wouldn't think about for a safe but would be perfect place to store an extra key for each vehicle and other important keys. Thanks for the chance to win this great safe. I could definitely use it! I also like the 0500 Fire CHest!